The Outfit System UI. Note that it tells you where the style can be found as well. Players are granted one free outfit per character, with additional outfit slots purchasable via the Crown Store. You may purchase up to 9 additional slots per character, and these are not shared between characters. Any outfit can be edited at any time at an Outfit Station for a cost in gold. Outfit styles are categorised into Light, Medium, Heavy, Undaunted, and Signature for Armor styles; and Axe, Hammer, and Sword for one-handed and two-handed weapon styles. Staves, bows, and shields have no subcategories. Outfits are created at new Outfit Stations, which replaced Dye Stations in the world. Note that this did not replace Dye Stations that were previously purchased and placed in home(s) (which may still be purchased from Rolis Hlaalu for 03535  ). Outfit Stations may be purchased from Faustina Curio for the much more substantial price of 500500  . Existing Dye Stations in homes had their names changed to "Outfit Station", but have the same functionality as the more expensive ones, so the only difference between the two is their price and appearance. Outfits can be created via gold. Each piece added increases the cost, depending on the rarity of the item. Rare items, such as a Telvanni-style weapon, can cost up to 000060006,000  per piece. Small armor pieces, including shoulder, hands, waist, and feet, are the cheapest. Large pieces, including head, chest, and legs, cost twice that. One-handed weapons and shields cost 3 times the small armor price, while 2-handed weapons (including bows and staves) cost 6 times the small armor price. You may also dye your items as part of the Outfit System, using any Armor Dyes you have unlocked. This costs 0000005050  a piece for armor and 00000350350  for all weapons and shields. This charge is per color slot on each item, so it can get very pricey. If you only want to change the color and not the style of your armor, do so before you put on an Outfit. For weapon dyeing, this is not an option. 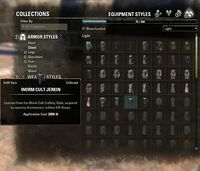 Alternatively, you can purchase Outfit Tokens from the Crown Store, which grant you a free single-use outfit change regardless of how many items you change or how rare your style choices. You do not need to change the style for all your armor. To leave a piece with its default appearance, simply select "Clear Slot" at the top, which costs 0000005050  if you are changing an existing Outfit, but is free on new Outfits. In addition, you may choose to hide your helmet as part of the Outfit. This option is free and appears at the top when selecting the Head style. Cleared slots in an Outfit cannot be dyed for free. Unlimited free armor dyeing still exists, but is not available if you are wearing an Outfit. To combine Outfits with traditional (free) armor dyeing (e.g. if all you wanted was to dye your weapon), remove the Outfit, change the dyes on your armor the way you want them, and put the Outfit back on. Otherwise you will be charged gold for each color change you make. Likewise, Costumes can still be dyed for free if you are an ESO Plus subscriber, or used with Dye Stamps as previously. Any craftable style known by any of your characters can be selected at an Outfit Station. In addition, there are styles that cannot be crafted, but you can learn sections of them for outfit conversion. Note that all normal styles are available in Light, Medium, and Heavy versions, so the total number of available styles is 3 times the amounts listed here. While most of these styles are craftable and available as crafting motifs, some are obtainable only as outfit styles. †Note: These styles have only 3 variants for the Head pieces, but 4 for the rest. These styles are not craftable, and their pages are only available during veteran dungeon events. Only certain pieces are available in each style. For armor, the head, shoulders, and shield are available. For weapons, there are bow, staff, one 1-handed melee weapon, and one 2-handed melee weapon. Additionally, only the heads and shoulders are available for free; all other pieces must be purchased in Crown Store packs. While the head and shoulder styles are classified as Undaunted styles, the arms packs are classified as normal weapons. The following Undaunted styles have been datamined and are expected to become available in the future. Signature Styles are outfit styles obtainable from Champion's Prize mails earned upon completion of Battlegrounds. The chance of obtaining one increases according to one's team's position. Each style pertains to a Battlegrounds team and a Battlegrounds type. They fall under their own category, though they are named as heavy armor pieces with the exception of headpieces. Firedrake Style 000010001000  000020002000  000030003000  000060006000  Style pages occasionally earned after Land Grab games. Pit Daemon Style 000010001000  000020002000  000030003000  000060006000  Style pages occasionally earned after Deathmatch games. Stormlord Style 000010001000  000020002000  000030003000  000060006000  Style pages occasionally earned after Flag Games games. Cuirass is light armor. While these styles are treated as normal styles by the in-game UI, these styles usually consist only of single pieces. Mystic Eye Psijic Cuirass — (?) — — A heavy armor chest piece very similar to the Psijic cuirass style. These are actually classified as Clothing rather than as normal styles. Obtainable from Psijic Vault Crown Crates, except the Warden Gauntlets, which are available as a quest reward for completing Lost in Translation.